There are many things I love, people. There is nothing I love more, though, than being on the inside of an event. I love to be in on the staging of events of all kinds, from birthday parties to galas. And I think the thing I love most is being in on the staging of an event like a music festival - because I love music, I have always enjoyed musicians, and I love the dizzying, busy, crazy atmosphere of the entire thing. And that is why this past weekend I volunteered for all three days of the Nexen Canada Rocks Festival. That's how I found myself backstage at MacDonald Island for three days straight, filling ice buckets, carrying cases of beer, and generally having a helluva good time. One of the great parts of an experience like this is living it. 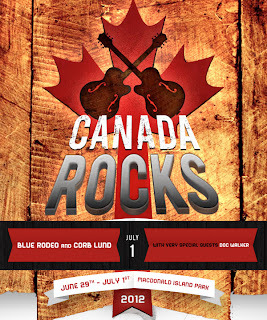 The next great part is sharing the story with other people so they can live it vicariously, and so here goes with my three-part review of Canada Rocks. Friday I arrived at Mac Island in the late afternoon, ready to roll and finding that the Mac Island staff had already gotten dressing rooms organized and ready to be prepped. This is a good part of what I do when I volunteer for "artist hospitality". It's a fancy name for the job of making sure the artists have what they need - food, beer, ice, water, coffee - and generally trying to be as unobtrusive as possible while still being as helpful as you can. 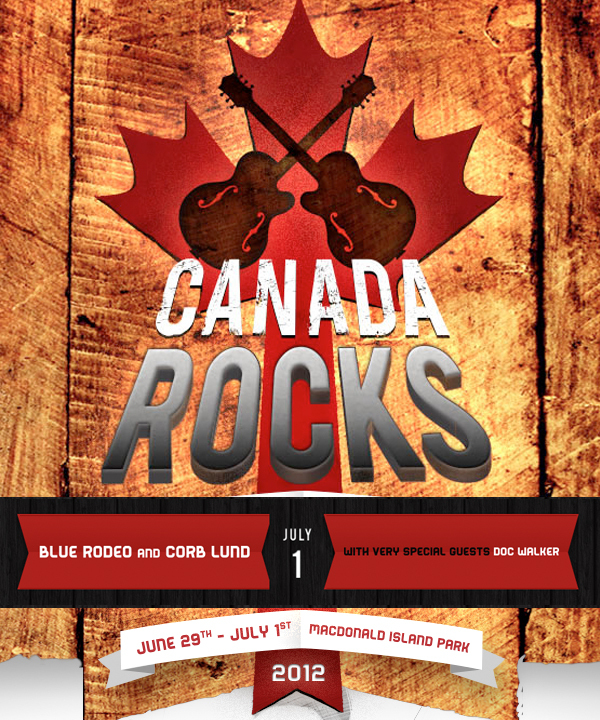 As you might know Canada Rocks is organized by Events Wood Buffalo, our local events planning group. At this point I'd like to say a few words about EWB, because they have not only my fondness but even more importantly they have my total respect. Last year I worked the SummersEnd music festival, but with an entirely different group from the EWB as they have had an almost complete turnover in staff since then. Despite this turnover, though, EWB once again managed to arrange and organize a completely stellar event, with many staff who had never run one of these events in Fort McMurray before. Many of the EWB staff are seasoned professionals, like David Whitelock and Nadia Power, and under their direction and skill the Canada Rocks festival came together beautifully. It was a genuine pleasure to work for them, and I would do it again in a heartbeat. So, there I was Friday, organizing the dressing rooms. Some of you may know what a "rider" is in terms of musicians - and it's not some guy on a horse. It's the contract stating what you must provide the artist/musician while they are at your venue - food, beverages, and the like. So a good deal of artist hospitality is ensuring the requirements of the riders are met, meaning you need to have lots of water and ice and snacks and beer. It's a pretty daunting task, really, when you consider a festival involves several different acts each with their own rider and requirements. My job was easy, though, as all the shopping for the riders had been done and it was just a matter of stocking up the dressing rooms. I had also been asked if I would take on a special task at Canada Rocks. You see, MacDonald Island Park and Events Wood Buffalo often run artist "meet and greets" - a chance for fans to meet the musicians. Often these are people who have won contests through the radio stations sponsoring the shows. And it's a pretty big deal, these meet and greets. I've been to a few in my day and it's always exciting to meet someone you admire and respect. So, when Mac Island and EWB asked if I would run the meet and greets for the weekend I was past honoured and way into thrilled to take on a pretty important job. After all this is the only time most of the musicians have direct contact with local fans. It's important to ensure that both sides of the meet and greet enjoy the experience. It's important that the artist is protected if necessary and that the fans are able to enjoy meeting someone they may have idolized for years. I was very pleased, especially knowing the first artists on the bill Friday were East Coast greats "Hey Rosetta" and Joel Plaskett. As the time approached for the "Hey Rosetta" and Joel Plaskett meet and greet we decided to invite a few more people to it as we had some spots open. And this is when I was able to do something that gives me great pleasure, people. You see, in my time writing this blog many people have done wonderful things for me. They have invited me to events, and given me tickets to things. They have extended so many kindnesses, ones I know I could never repay. Instead of repaying them, though, I decided long ago to instead pay it forward. So, when I have a chance to extend an opportunity to someone else, when I have a chance to make someone else happy, I leap on it. And this is what I did on Friday when I called my dear friend Blake, who is a huge "Hey Rosetta" fan, and who was celebrating his birthday, and invited him to the meet and greet. Blake was thrilled. Past thrilled, in fact, and his delight was quickly my own as he expressed his gratitude for my invitation. I could only smile. While he thought he was getting something special it was me instead, because I was getting to do for him what so many others have done for me. I was getting to pay it forward once again, and nothing in the world feels better. Blake did indeed come, with his son Nathaniel, and he and several others had the chance to meet the members of "Hey Rosetta" as well as Joel Plaskett. The meet and greet was terrific, very casual and low key, a meeting between fans and artists who are not only skilled musicians but wonderful people, humble and a delight to work for backstage. It was a genuine pleasure to facilitate the meet and greet, to see the fans interact with the artists, and to see both sides walk away buoyed by the experience, the artists off to play their show and the fans off to enjoy it from the other side of the stage. It was wonderful performance from all reports. I left backstage briefly to enjoy a bit of the show, hanging out in the VIP boxes and mingling with those from this city I have come to know and admire so much. I loved seeing the crowd react to the music, and the artists feed off that energy in return. In the end, though, I snuck away rather early, driving home from Mac Island knowing that I had another busy day the next day, another day backstage, another day of ice buckets and beer cases and musicians and fans. Even I didn't realize, though, that the next day would be another opportunity to pay it forward - and to do so with someone that despite their young age has become one of my best friends, and someone for whom I have both admiration and respect. While Friday was "Hey Rosetta" and Joel Plaskett day Saturday would be K'Naan day - and little did I know Friday night what a special day that would turn out to be for me - and for one ten year old boy.